The different colors and shapes of the glass indicate that it came from at least three different glass objects. Some pieces of glass are rather thick, and some have design elements molded into the glass. Hence at least some of the glass is not from low-cost beer bottles. The glass appears to be old. That's consistent with the discovery of other historic artifacts in the park. Underscoring its commitment to democratic journalism and open science, the Tribune has made its glass collection accessible to everyone. 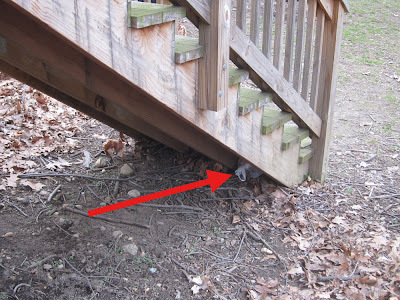 The collection is in a plastic bag hidden under the wooden steps. Anyone can add more glass to the collection and study the glass that has been collected. Of course, broken glass is sharp, so be careful when handling it. Gloves are highly recommended. Arlington County attaches high importance to park safety. 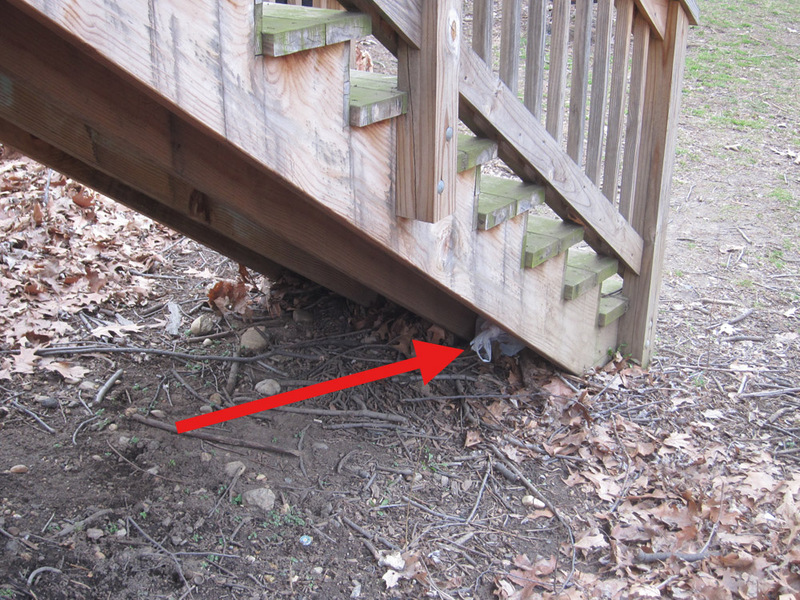 Any residents concerned about park maintenance can email dpr@arlingtonva.us or call 703-228-6525. Park Rangers can be reached at 703-252-0168. 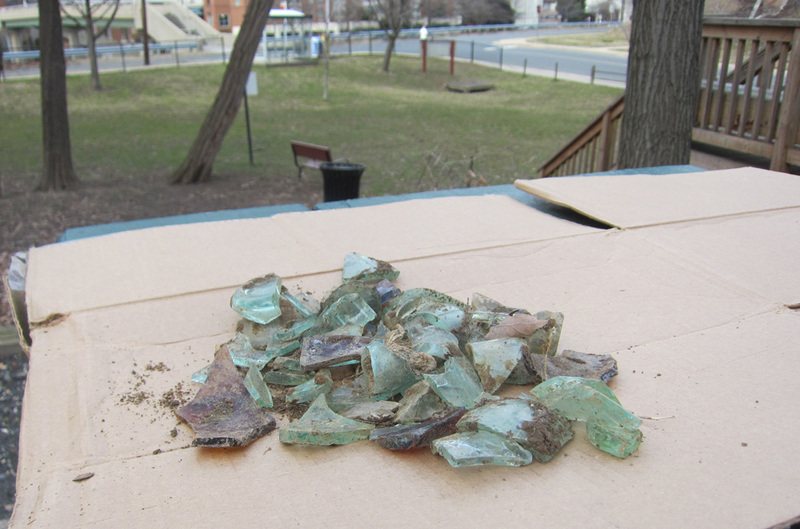 The Ode Street Tribune has informed the Parks Department of this glass investigation and hopes that the Parks Department will participate. I am shocked at this lack of objectivity and failure to maintain appropriate distance from the subject at hand, in addition to the OST's willingness to put its reporter in harm's way. I intend to file a complaint on behalf of the reporter with the Communications Workers of America, and I believe that this is also an issue for Reporters Without Borders. Even Rosslyn, as exceptional, separate, and distinct is its, is not exempt from the canons of journalistic ethics and practices. Shame! I commend the Ode Street Tribune for taking this positive step to clean up the park. While Rosslyn is near D.C., reporting from a park in Rosslyn is not quite like reporting from a war zone. Clean parks make Rosslyn a better place to live. I hope that this action by the OST inspires others to act. The person that made the first comment above clearly does not understand that the ODE Street Tribune is not bound by "old Media" rules. The Ode Street Tribune is a new type of news organization. Helping to make the park a better place is directly in line with what the OST is all about. these comments open a window on bottled-up frustrations with the lack of transparency and broken promises of modern journalism. Is the glass half-empty or half-full? Critics are reminded that those who live in glass houses should not throw stones, especially if they live near a park. Don't yu get it, the Glass if Broken !!! !